A very clean and well kept 2 Owner 2015 Audi Q7 Premium Plus Quattro with excellent service history and a clean Carfax report. 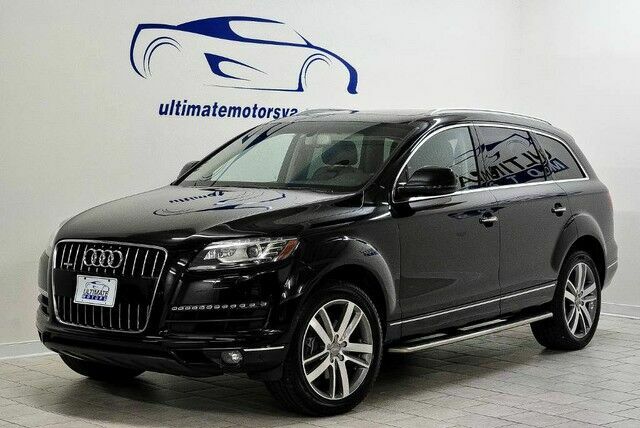 This Q7 is a local Richmond VA owned and garaged Audi, and it is in excellent condition. All service records are documented, performed by Audi, and available to view on the Carfax report. Very nicely optioned with Technology Package Package, Cold Weather Package, Premium Plus Package, and Bose Premium Sound Package, including: Blind Spot Monitoring, Navigation System, Rear View Camera System, Front and Rear Parking Sensors, Panoramic Sunroof, Premium Leather Interior with Front and Rear Heated Seats, Heated Steering Wheel, Keyless Ignition and Entry, Premium Sound System with Bluetooth Audio, Satellite Radio, Aux/ USB, CD, 3rd Row Seating, Power Liftgate, Factory Running Boards, Premium 20 inch Wheel Package, and all standard Audi Q7 power and luxury features. Its Black exterior finish has a brilliant showroom shine that is free of any dings, dents, or scratches. 4 curb free 20 inch wheels with a nice set of Perelli tires complete the showroom look and appeal. The interior cabin has been very well preserved and features blemish free leather seats and carpeting. This Q7 is non-smoker vehicle and it is free of any odors. Fully serviced and inspected, including a fresh synthetic oil service, and a new Virginia state inspection. It is completely ready for it's new owner. Our affiliation with over 20 credit unions affords our customers great interest rates plus we have extended warranty options that will fit your budget and driving needs. Please give us a call at 804-378-8656 or visit us 24/7 @ www.ultimatemotorsva.com There's more to buying a pre-owned vehicle than price...Just read any of our 160 reviews.